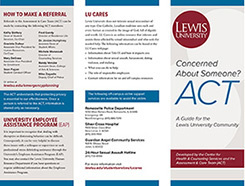 Services, Campus Police, Human Resources or by completing the ACT (Assessment & Care Team) referral form below. Experiencing hospitalization for psychiatric, drug or alcohol problems. Disruptive Students brochure or Z-Card for more specific guidelines.